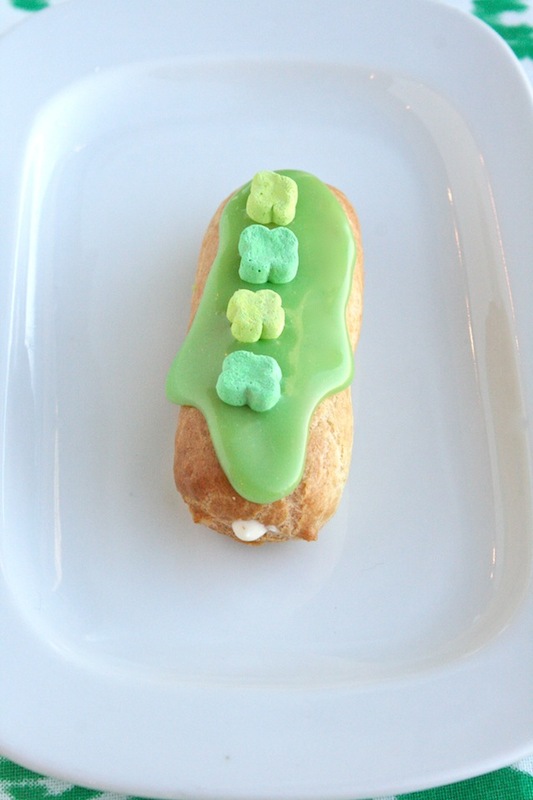 Luck Charms Éclairs—Simple (Green) Saint Patrick's Day Dessert Recipe! / Hey, EEP! 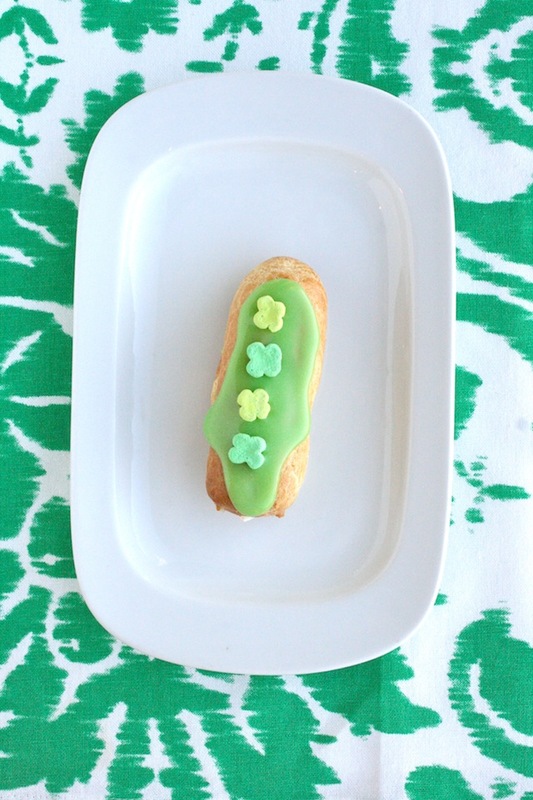 Luck Charms Éclairs—Simple (Green) Saint Patrick's Day Dessert Recipe! I love making cereal dessert recipes and I have a special weakness for marshmallow bits. So I decided to turn Lucky Charms into a few next-level treats for Saint Patrick's Day! These new Lucky Charms are sort of fancy. All of the marshmallows are green—perfect for our purposes, don't you think!? Good Housekeeping just posted my collection of recipes. Head over there for the full spread—and some cool info about Lucky Charms (like, did you know they started as just Cheerios with chopped up Circus Peanuts tossed in? )—or snag my favorite recipe of the bunch, below! 1. Preheat oven to 400˚F. Line lg. jelly-roll pan with parchment paper. 2. In food processor, pulse Lucky Charms 1 min. or until finely ground; transfer cereal to med. bowl, add flour and whisk until combined. 3. In 3-qt. saucepan, heat water, butter, and salt to boiling on med. until butter melts. Vigorously stir in flour mixture all at once until mixture forms ball and comes away from side of pan, about 3 min. Remove from heat; let cool slightly. 4. Add eggs, 1 at a time, beating well after each addition, until batter becomes smooth and satiny. 5. Transfer batter to pastry bag fitted with lg. round tip (or plastic bag with corner snipped off). On prepared pan, pipe 4- to 5-in. long strips of dough; flatten any points with damp fingertip. Bake 35 to 40 min. or until golden brown. Turn off oven; keep éclairs in oven while it cools for 15 more min. Transfer to wire rack to cool. 6. Put white chocolate in med. heatproof bowl. In sm. saucepan on med. bring heavy cream to boiling. Pour over chocolate; let sit 5 min. Whisk until melted and smooth. Tint with green food coloring, if desired.